What a week so far! There’s still so much going on at work and getting a jury duty summons for next month and dealing with a very pricy brake repair on my car is just icing on the cake. 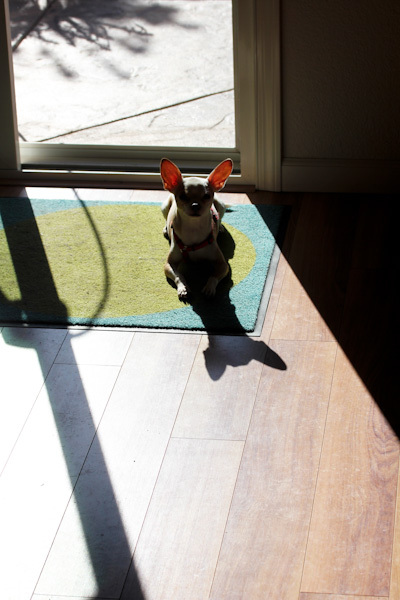 Though jury duty might be a less stressful alternative to work, hmmm… I think being slightly exhausted from half marathon training has made me a little cranky and emotional this week, I melted down on my poor hubby last light about dealing with car issues and other stresses, poor guy! At least it’s starting to look and feel like spring here with sunshine finally after rain most of last week! 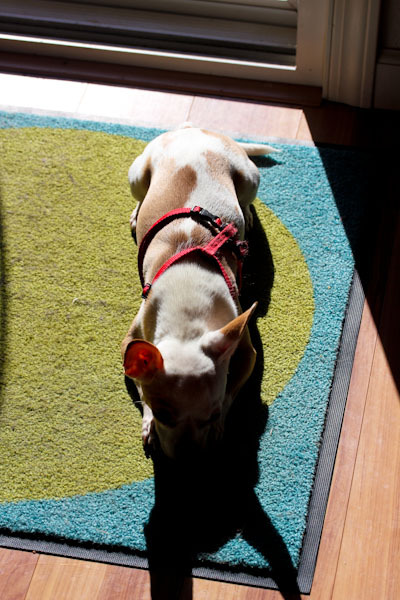 And Miko has been enjoying a little sun bathing. 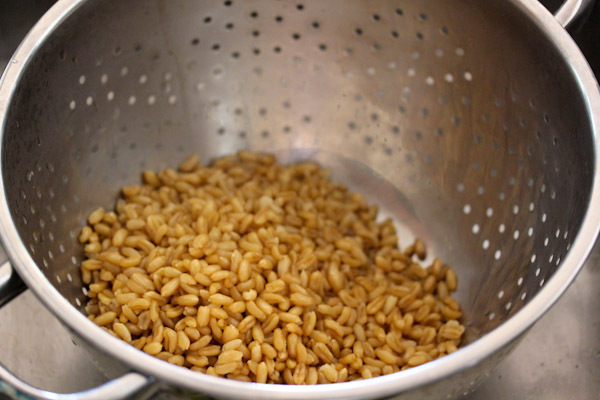 And I did get some time this weekend to experiment with another recipe including kamut berries since I have a pantry full of them still from buying a 4 pack of Bob’s Red Mill Kamut Berries on Amazon. Saute olive oil and onion over medium-high heat in a large soup pot until translucent. 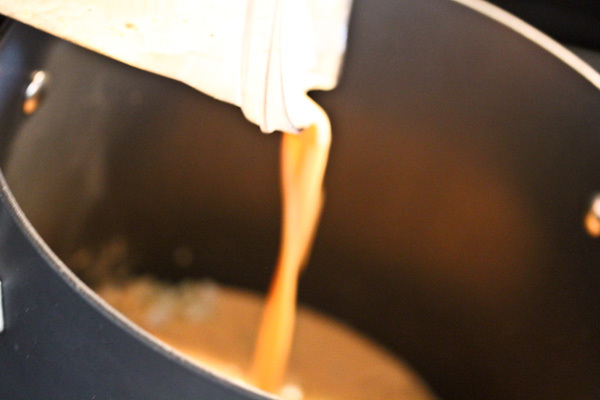 Meanwhile, place sauce ingredients into a high speed blender and blend to a smooth liquid. 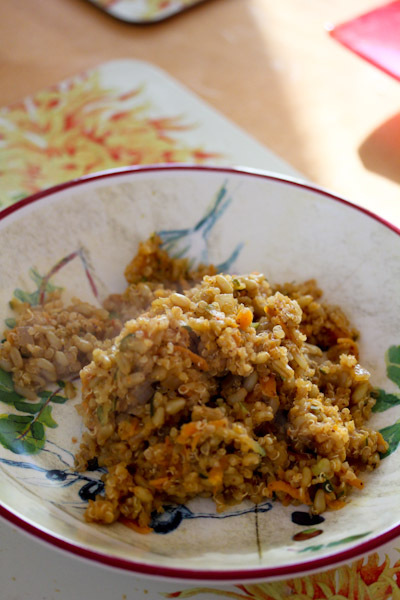 Add cooked kamut berries, quinoa, zucchini, and carrot to the soup pot and pour sauce over. 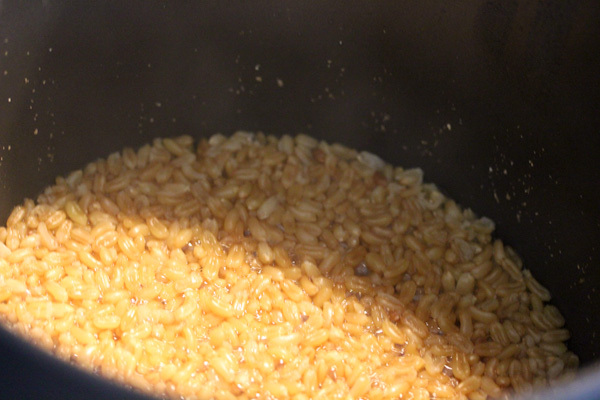 Bring to a boil over high heat, reduce heat to low, cover and simmer for about 25 minutes stirring occasionally. Kamut berries are becoming a delicious obsession of mine lately because of their meaty, hearty, and chewy texture. They hold up well to being slow cooked and are very filling. But they’re time consuming to cook, taking an hour to simmer alone before using in a recipe – not an option on a weeknight for me. But they can be cooked ahead of time and stashed in the fridge for a few days of freezer for a few months ready to use in a fast recipe. For this recipe, I cooked them in the large soup pot, drained and set the kamut berries aside in a strainer while I cooked the onions and prepared the sauce in the Vitamix. I am spoiled by having the ability to make fresh veggie dips, dressing, and sauces in the Vitamix now, so many possibilities for raw and cooked recipes. 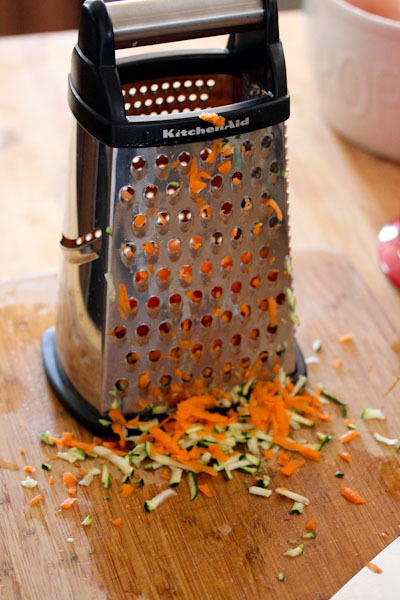 A cheese grater worked fine to grate the zucchini and carrots and was a little faster than dirtying the food processor for this small amount. When all the ingredients are mixed into the soup pot, it looks like a wet stew. 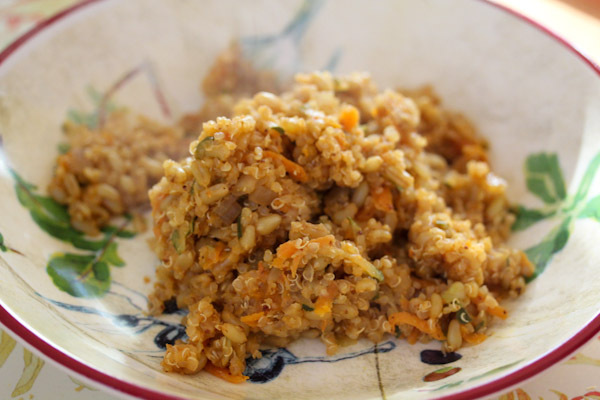 But the sauce liquids simmered into the kamut berries and quinoa quickly. 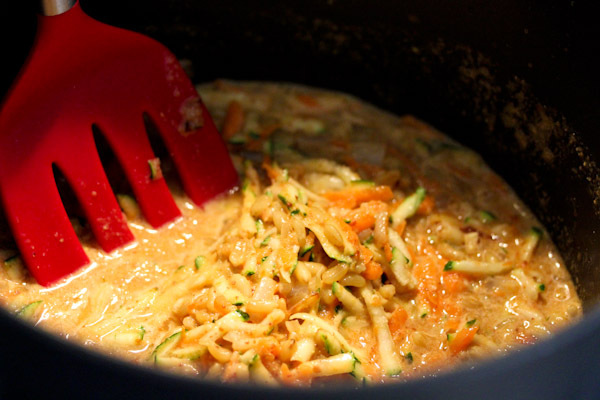 This dish came out nicely with a tangy and savory flavor from the sauce. 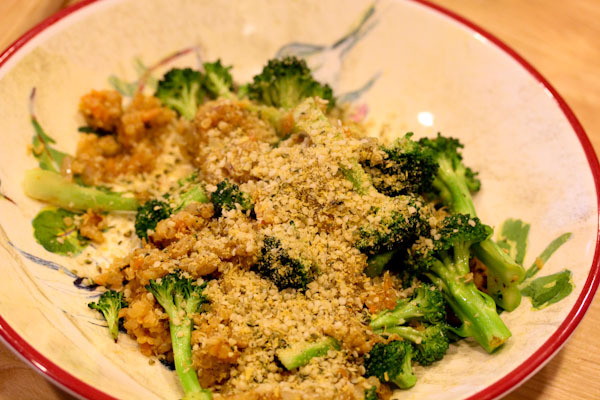 And it had a nice variety of textures from the soft quinoa, chewy and firm kamut berries, and the shredded veggies. This recipe is huge making many servings which I like since the kamut berries are time consuming to cook, the leftovers will sit in the fridge for a few days to re-heat, serve cold over salads, or stash servings in the freezer for fast and simple meals months later … like on stress-induced melt down evenings. 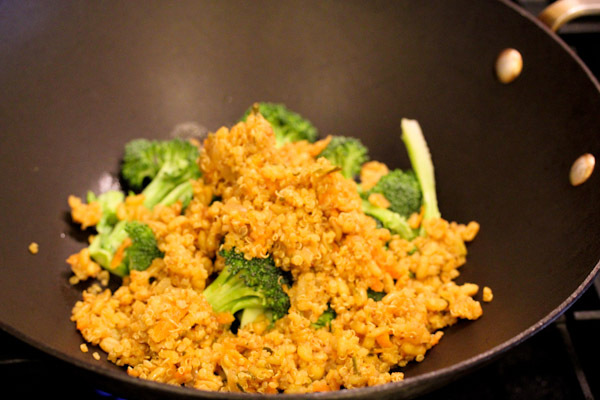 I remixed the leftovers for dinner tonight sauteing a serving in a wok with fresh broccoli. And I topped it with a simple mixture of hemp seeds, nutritional yeast, onion powder, garlic powder, and salt for a vegan parmesan cheese alternative that was very tasty. 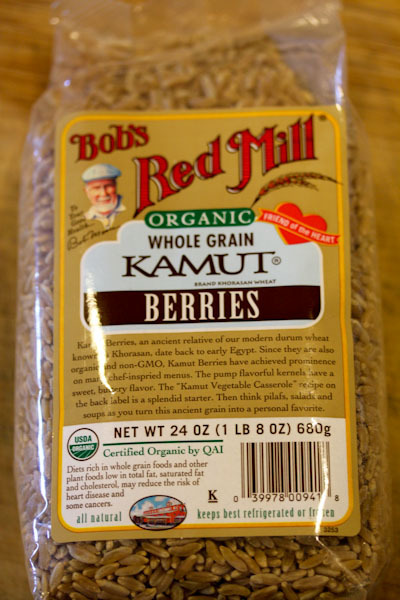 I’ve had kamut berries before but I’ve never made them myself…you make me want to! Yummy grains and sauces make me happy! Love that sauce!